The above info came from Amy Cockerham and jeanette mayer, and was edited by yours truly (contact me). The image came from an untitled website. 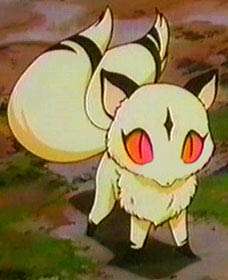 Kirara is a fire neko-youkai who is used for transportation by Sango. She has two forms, one of a small kitten, and one of a large cat resembling a saber-toothed tiger. She is very cute and cuddly in her kitten form, but in her big form flames emerge from her feet and tails and she can take on even the most dangerous of demons. Also in her big form, she can fly, which is useful when Kagome wants to return home. She normally carries Sango and Miroku because they can't keep up with InuYasha as he runs. Kirara is Sango's pet, but her original owner was priestess Midoriko, the creator of the Shikon no Tama. 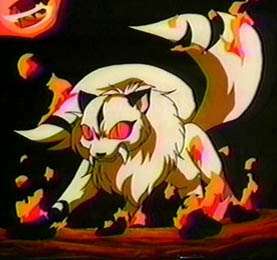 Kirara appears in episode 24 (along with Sango) as the only one alive in the village Naraku destroyed. From then on, Kirara, along with Sango of course, helps InuYasha, Kagome, Miroku, Shippo, and Sango in their quest for the Shikon Jewel. I'm told Kirara's name means "mica" in Japanese. There appears to be some controversy over how to spell this character's name. In Japanese, it is spelled 雲母. Using Hepburn romanization, this would be spelled as "Kirara". In Japanese, the "R" and "L" letters are pronounced the same way, and are written as the same alphabetic character. The pronunciation is a cross between the English "R" and "L" sounds, which is why picking one or the other for translations can be difficult. In the English dubbed version, this character's name is pronounced "Kilala". And yet, episode 97 is titled "Kirara Come Home". So it's not hard to see where the controversy comes from. The above description came from Amy Cockerham, Tiff, Emily, and Kyoto's fan, and was edited by yours truly (contact me).